Its been a week since I saw this movie but I dint find the time to write about it. Rather I dint find words that would explain the terror this movie is. Okay that might have been a bit over exaggerated :P . Still the much hyped movie hardly lives up to it. Its been already declared a flop in trade circles. After the debacle called 'Kites', here comes another disappointment. A few pointers from the movie (Spoiler alert!). 1) Yes, this is loosely based on the Ramayana. But it doesn't even come close to the Mahabharat called 'Raajneeti'. 2) Story: Ram and co hurt Raavan's sister, so Raavan kidnaps Ram's better half to settle scores but since its a bollywood movie, he has to fall in love with her. She too develops a soft corner for her kidnapper but soon her husband comes and gets her. 3) The movie has been shot beautifully. Watch this movie for the cinematography by Santhosh Sivan. 4) Aishwarya looks breathtakingly beautiful. Even when she is tied to a pole like a dog, she looks stunning. 5) Abhishek can never look menacing. He actually looks funny when he's trying to act scary. 6) For the first time ever, A.R Rahman's music disappoints. Although I do like the 'Behne De' track. 7) Vikram looks woohoo :-). But his South Indian accent is plain annoying. I loved his clothes and his tight lipped act. 8) The dance sequence of Aishwarya with Vikram was totally unnecessary. I hated her clothes and she deserves the flak she's getting for it. 9) I loved two scenes in the movie. First, when Raavan's huge boat crashes into Ragini's little canoe. Second, when Raavan confesses to her that he is in love with her. Apart from these two scenes the only things I remember seeing is water and mud, mud and water. 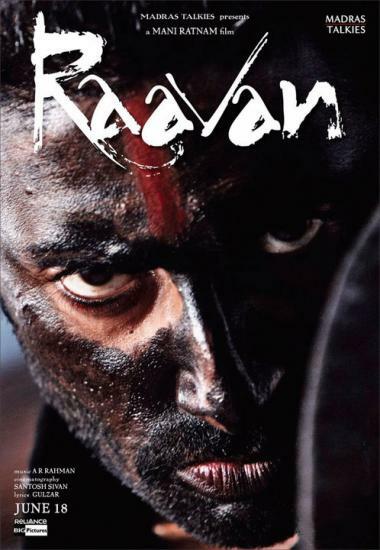 10) 'Raavan' has only one resemblance to 'Raajneeti'. Here too the woman (Aishwarya) is used as a pawn. Raavan uses her to get back at Ram, while Ram uses her to capture Raavan. Sad. 11) The chemistry between Aishwarya and Abhishek is tepid. After Guru, I expected something much much more. 12) Mani Rathnam has only relied on the star cast and the beautiful locales, and has forgotten to polish the story. 13) Govinda rocks in the movie. 14) Absolute strangers could have been used in Priyamani and Nikhil Dwivedi's roles. 15) Love, sure is a crazy thing. Makes you want to kill, makes you want to die. Bollywood needs to take a check on its movies now. I just read that the first six months of this year caused a loss of 250 crores for the Hindi film industry. What else will happen if you make non sensical movies like 'Kites', 'Raavan' and the most annoying movie of the year, 'Karthik Calling Karthik'. Lets hope that the rest of this year atleast makes up for these losses.